The adventures in blouse/collar drafting continue, and before I go any further, I have to say that I am delighted with how this turned out! This blouse is based on a blouse I spotted on Pinterest. My fabric is some black polyester crepe that was left over from my 1940s style dress. This fabric is just gorgeous, it's from Minerva Crafts, and I want a bolt of it in all the colours, but sadly it's only available in black. It was 60 inches wide, but I only had about 83 cms in length, so was pleased to be able to squeeze everything but the sleeves out of it. I made a little shoulder yoke, as on my 1940s style dress; and instead of using a bust dart, I rotated it to the shoulder, and gathered it. As with my last collar, this was drafted from the partial shawl collar on the Craftsy "Patternmaking And Design: Collars and Closures class". The roll line is where the collar folds over on itself, and the neckline is slightly curved. The insert at the shoulder (the shaded bit) is to allow for the shorter collar height, as it is not a full shawl collar. The pencil lines with arrows are the grainlines for the upper and under collar. I was afraid that this collar would look a bit puny, but cut it out and sewed it on. Then I was happy to find it it looked grand! and the armholes are finished with bias tape. I don't know why, but I thought that princess seams would look well on the back. I don't love them, but I don't hate them either; I don't think I'll use them again on this style of blouse though. I also added 3/4" to each side seam, blending up to the waist. This goes well with both skirts that I made for the #VintagePledge, and I have a few more variations planned, although having worn this and the first shawl collar blouse a few times, I am going to lower the front neckline a bit. Also, I might take 1 cm off the height of the back neck and inner shoulder edges. 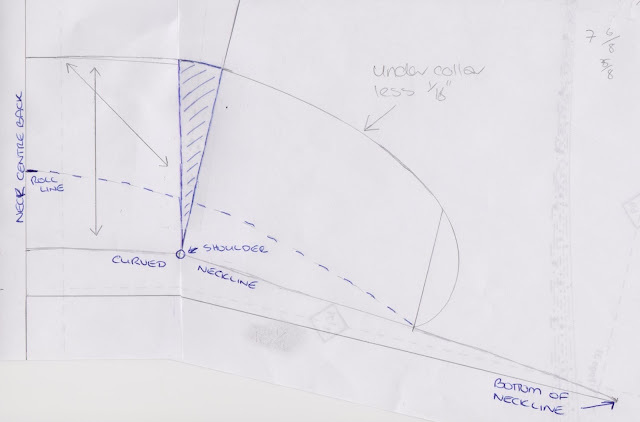 This was something that I was shown to do on shirt and convertible collars at my pattern drafting class, and I think it will open up the neckline a bit. I'll see how it goes, what's the worst that can happen?! This looks great, but agree with you on taking the neckline down a little. I love the gathers at the shoulder and the collar though! Thank you! I agree with your agree! I'm going to lower the front by 1.5 inches and see how that looks. This is so sweet Lynne! I love the gathers and the little collar. your drafting skills are so impressive, you make me think I should check out those craftsy classes! Thank you! The Craftsy drafting classes are great, and so easy to follow. Lovely top, the fabric drapes so nicely. 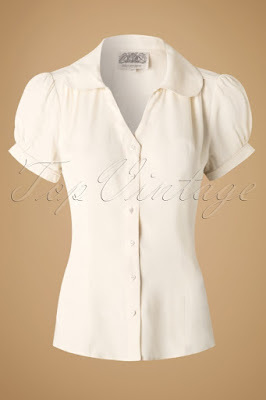 The shoulder gathers remind me a bit of the vintage shirt dress from sew over it, I've been thinking about turning that into a shirt lately. Thank you! This fabric is just gorgeous, and turning the Vintage Shirt Dress into a shirt is a brilliant idea! I'll have to remember that. Thank you! I love how the collar turned out. You're on a roll with these blouses! This one looks like it'll be a great wardrobe basic, and I really like the gathered yoke! Thank you! I really do need more blouses to go with skirts. I have another neraly finished, and am planning some more. Firstly, I am seriously impressed that you are able to take photos outside! I'd be frozen! It looks great, you look like you are learning something new every time you sew something. I might check out Craftsy for some sewing classes. I've only used them for knitting until now. Thank you! It really wasn't too cold the day I took these, and this week has been lovely. But of course today is a bit overcast, and I wanted to take some photos! I love this! Such a classic design, so versatile and nicely fitting. I am working my way through Suzy's classes and it is so exciting to see the projects that come out of them. Yea for drafting! Thank you! Good luck with the classes, I find them so easy to follow and Suzy is very good at explaining things. Wonderful shirt! I am really impressed with what you are doing! Love it with your skirts as well! Can't wait to see your next project! Thank you! My next project is a shirt, I just need to take some photos first. Thank you! I definately need some more blouses like these. Seven weeks of sewing sounds like heaven - enjoy!! Really neat. Yes, lower the neckline. I wish I those skills. Thank you! I might do a bit of work on the pattern this afternoon. Looks great, how lucky you were able to squeeze this out of leftover fabric. The gathers and yoke really work. Thank you! I was really pleased to get it all cut out from my fabric. I thought I would have to cut the facings from something else.